With my oldest home for the summer I have been baking and cooking up a storm. They are able to eat more food than I would think possible for two little children. They are always able to surprise me, especially when it comes to food. As I have posted before I have a new herb garden after my last one left my porch (with help). I try to use everything that I grow in my garden, with little waste. The herb garden that my mother in law purchased at the farmer's market had approximately 15 different types of herbs making for a lot of new recipes. In particular I had 4 large sage plants which I searched for new recipes to try. My two boys love berries in baked goods, so I searched for recipes that combined berries and fresh herbs. I decided on a new recipe for Strawberry-Sage Muffins. This recipe has 9 ingredients. It takes 40 minutes of total time, 10 minutes of which is active and makes 18 servings. I did make a number of changes to the original recipe. First since I eat gluten free I used a combination of brown rice flour and gluten free all purpose flour as a substitute for the all purpose flour. I love sage, so I used 8 large sage leaves in total. One thing that I did slightly differently than the original recipe is that I tossed my strawberries with the sugar and let it sit for 5 minutes before adding it to the batter. This helped to sweeten the berries and made for a nice flavor in the finished muffins. Gluten free baked goods tend to take a little more batter so I ended up with a total of 14 muffins. I always fill my gluten free muffins to the top of the muffin liners since they don't rise as much as regular muffins. The strawberries in these muffins had a nice sweet taste which worked perfectly with the mild taste of the sage. The sage works as a nice compliment to the berries without being overpowering. My boys actually thought that these were strawberry muffins and had no idea that they contained herbs from my garden. 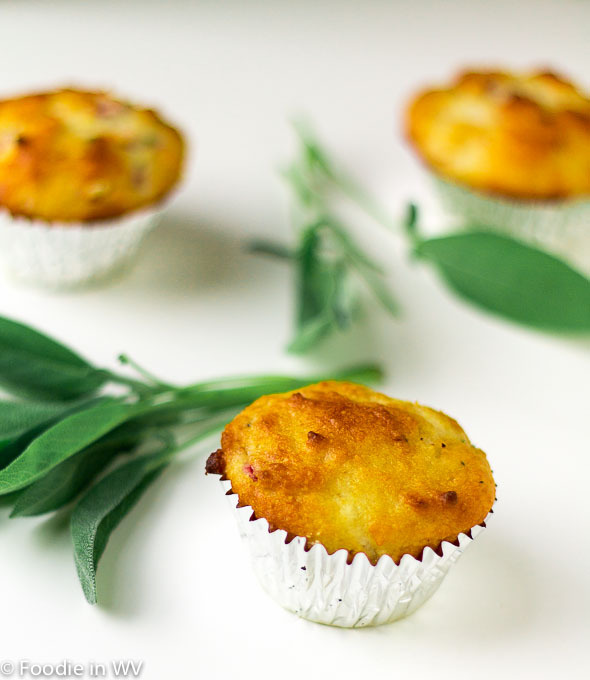 These muffins were a great way to use fresh sage. For the recipe go to Strawberry Sage Muffins. Oh, this is a great recipe! I have some strawberries in my garden and I was thinking to transform them into a beautiful desert for my bf. I haven't used sage in desserts before but the way you described it sounds amazing so I really appreciate the tip. I love sage too, it's great with chicken! I love raspberry muffins, they are one of my favorite! Thanks :) They turned out really well! My boys are like that. It almost always amazes me at how much food they can consume....and then be hungry again like an hour later. With mine it seems like two seconds later they are hungry again :) It drives me nuts! What a great idea! Muffins seem to be a great way to get anything. I agree, I love muffins! I had never tried it before either, but it works! They really did taste great! Mine too :) Thanks for hosting! You're so sweet, thanks for the nice comments! Thanks :) They were eaten pretty quickly! I would not have thought to pair sage with strawberries. I just use them in my protein smoothies right now. Sounds tasty. They actually go together really well. Sage has great flavor! It does add a really nice savory taste to fruit, I agree! This looks excellent. I have a lot of Sage in my herb garden, and with Strawberries being in season, and a strawberry farm just down the road, I think these will be on our list of baking this week. I have never tried sage and strawberries together so I am looking forward to seeing how they taste. My sage is starting to take over, so I have been using it a lot lately :) If you try try the recipe tell me how it turns out! I've never combined strawberries and sage - I have to stop over to check out the recipe! They really balance each other out nicely! Oh, I love the combination of strawberries and sage. These sound great! They really are great together! Strawberries and sage - what an interesting combo! These sound delish! It depends on the amount of fat and liquid. If I am using a higher fat flour such as almond or coconut I reduce the butter or oil. If I am using brown rice flour I increase the liquid. In most cases you can do a straight conversion and then add more liquid or flour in order that the batter isn't too thin or thick. Strawberry and sage....not a combination I would have thought of, but sure sounds good! Have you tried the cup4cup flour? I have heard it is an excellent substitute and you use it just like all purpose wheat flour, but it is expensive to buy, so I am looking for some honest reviews first! I haven't tried it :) I have tried just about every other GF flour though! YUM! These look great! Can't wait to try! Thanks :) They really were great!